In 1931 the population was 315, and this has since grown to 571 today. The village is 6 kms from Sain Bel, and 10 kms from L’Arbresle. In 2018, travelling in to Lyon is relatively easy, as Sain Bel is the terminus of an SNCF light rail service from Lyon Saint-Paul. L’Arbresle is the principal local town with a current population of 6,400. 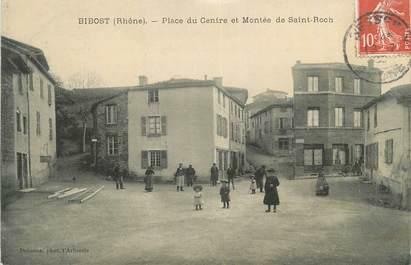 In 1934, Antoine Clauzel, who lived in Bibost, declared his transport interests, as was required by the new law. As you can read, he had transported milk since 1928 and passengers since 1932, using a 23 seat, 1932 vintage Citroën. 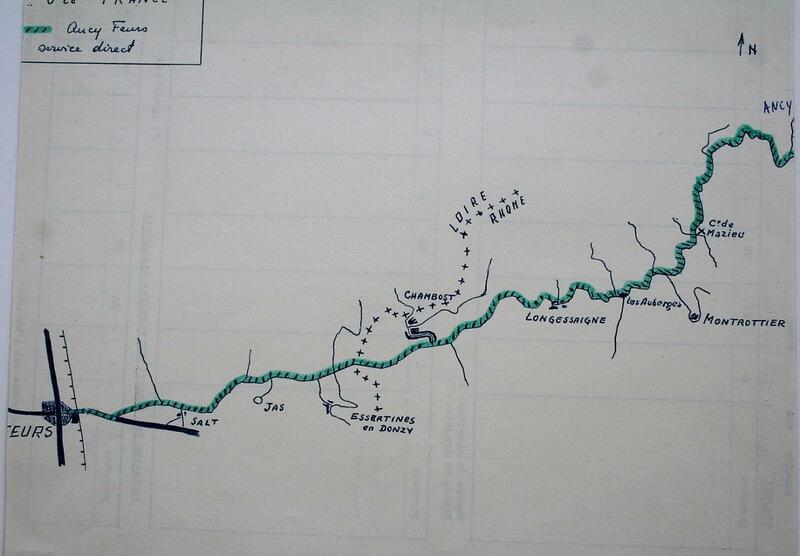 The route, from Bibost to Lyon via St. Julien and Sain Bel, was destined to be the backbone of activity throughout the life of the business. He was operating once daily, with two returns on Sundays, but one Sunday service was apparently milk only. To travel the whole distance cost 8 F for a passenger, or 5 F for 100 litres of milk! 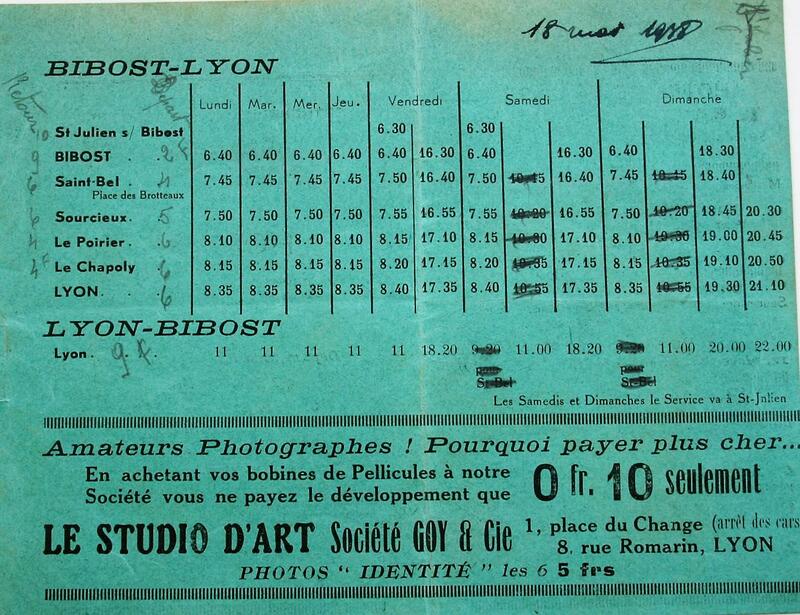 Below is the summer timetable for 1934, and the timetable leaflet for 1938. 1946 After the war (no wartime correspondence was found) Clauzel was requesting the reintroduction of 2 Sunday services, which were still generally banned for reasons of fuel economy. His request was granted. 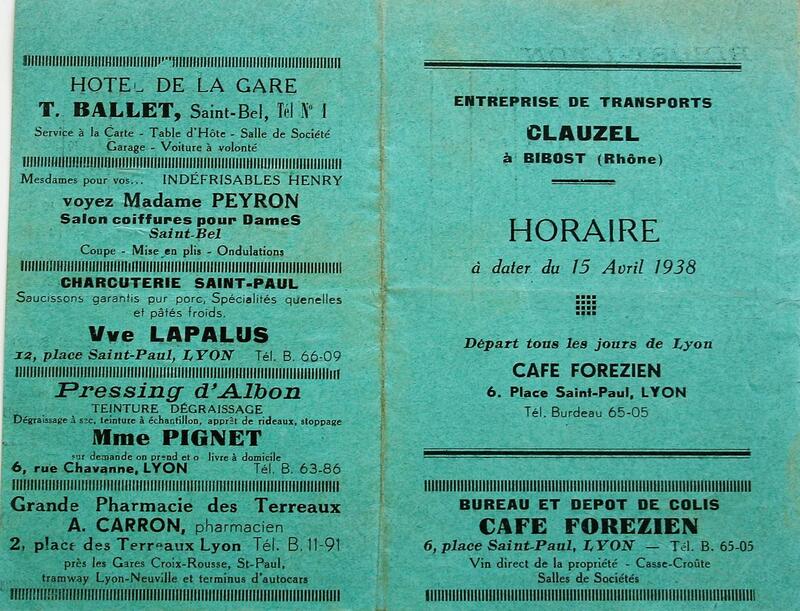 During the 1950s he was running a market service along the section of route from St. Julien to Sain Bel and L’Arbresle(1952) and he introduced a works service for Rhodiaceta from Lyon-Vaise to St. Pierre la Palud (1953). Rhodiaceta produced synthetic textiles but closed down in 1981. 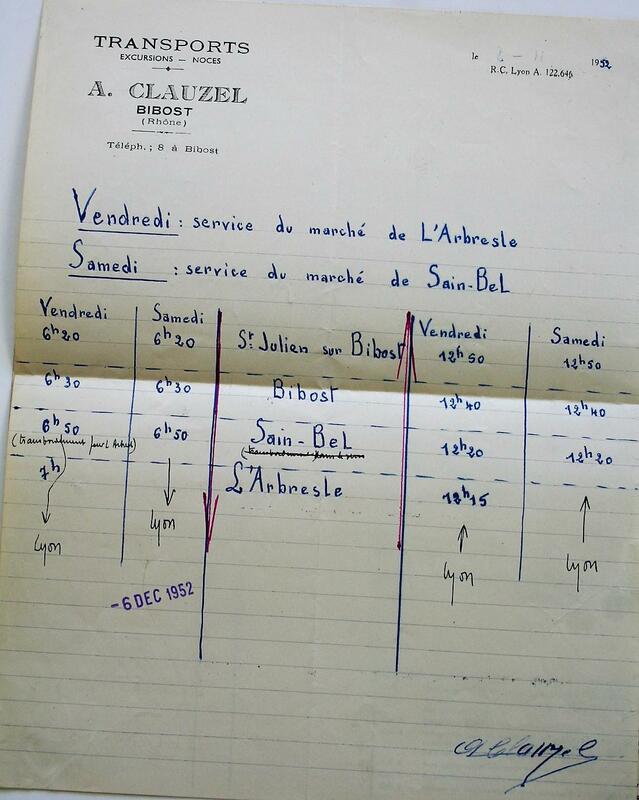 The market service operated to Sain Bel on Saturdays and to L’Arbresle on Fridays. But the waters were muddied by the appearance of Mr Jacques FRANCE of Ancy. He was operating four services of a market/schools nature in the L’Arbresle region. Ancy to Feurs was a single journey made on Tuesdays, winter time only, with a journey time of 1 hour. The outward trip started at 05.50 with the return at 13.00. The service began on 23 December 1952 and the fare was 5 fr per km. For a return trip (66kms) that came to 330 fr. Ancy to Tarare was being operated in 1948, but the service was with Clauzel in 1963. Ancy to L’Arbresle saw a number of school trips. Ancy to L’Arbresle. Mr France had purchased this market service from Mr Raymond, of Bois d’Oingt, on 02/06/1950, but the service was with Clauzel in 1963. And the Sté des Transports J. France put school transport in place for the school year 1962 -63 for the CET (Collège d’Enseignement Technique), and for the boys at CHAMPAGNAT and the girls at Ste Thérèse, L’Arbresle. So the relationship between the two operators has not been fully established, and in what circumstances Clauzel took over routes from France, is not known. 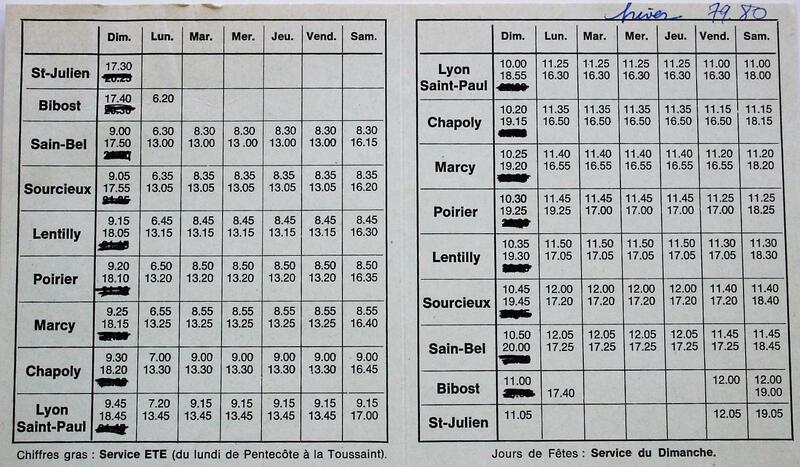 1968 The Ancy – Tarare market service was suspended on Thursdays from October 68 to May 69 because of losses, then suspended again from 16/01/71 to 27/03/71 for the same reason but on Saturdays as well. It restarted on 03/04/71 but on 30/06/71 losses were such that the service stopped. Clauzel needed a subsidy of 50 F per trip to continue. The CTD agreed a subsidy was necessary, without quantifying it. While the municipalities of Ancy & St Romain de Popey had proposed a subsidy, the amount was much less. So the service ended. 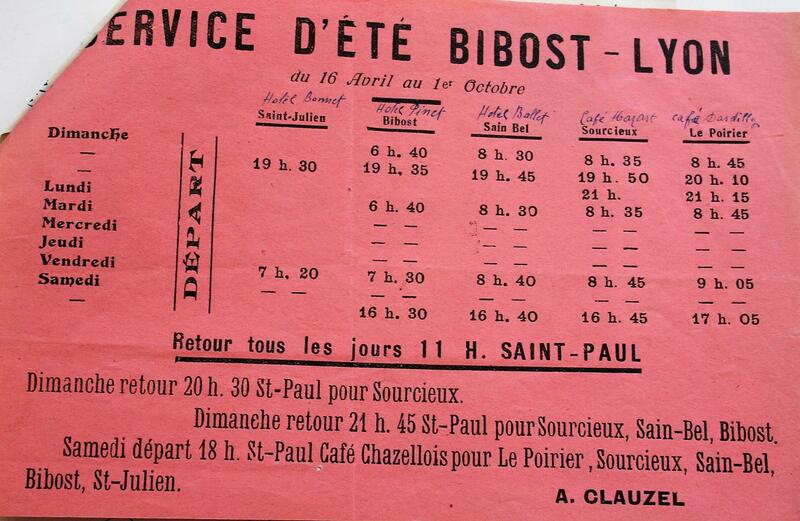 On 17/12/68 on the trunk Lyon- Bibost service, Sunday departures from Bibost at 0630 and Lyon at 0800 were suspended over the winter months, for lack of fares income. 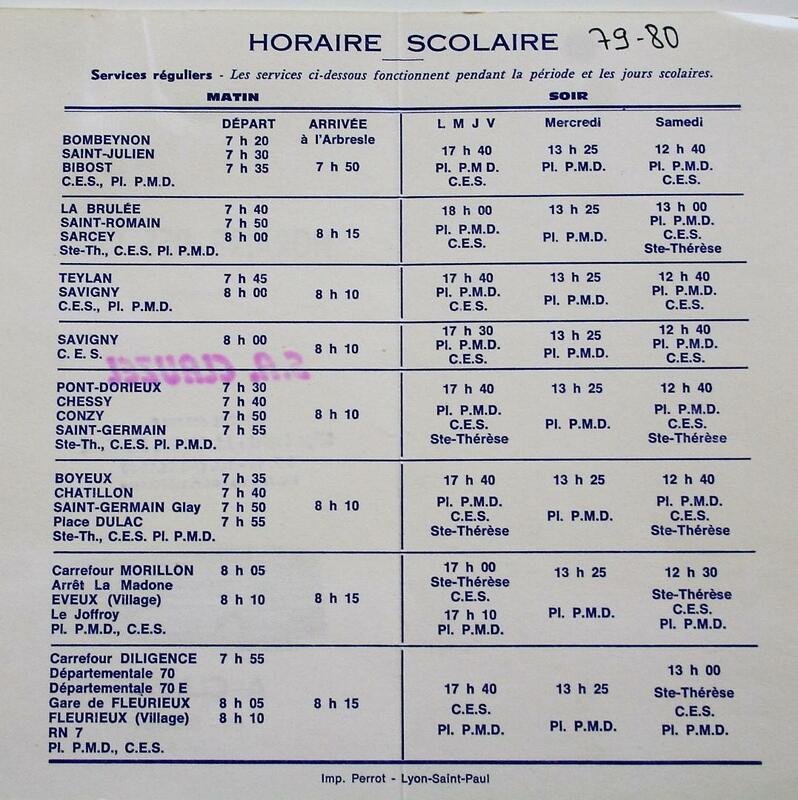 1971 On 23 July, there was a request for a school circuit for St. Julien sur Bibost – Bibost - L’Arbresle to avoid the 24 kms and 50 minutes taken by Clauzel’s longer circuit which also took in Ancy and Savigny. This was agreed providing that Clauzel applied the same fare as the market service over the same route – ie 1F80 for the full distance. Also in 1971, Clauzel was arguing with the authorities over excursion licences. The reader may need a reminder of the system. A licence authorizes one coach to undertake excursions – typically, (but all sorts of restrictions may be included) - with pick-ups within the département and adjoining départements and to all destinations within Metropolitan France. If you have several coaches, you can have multiple licences. These licences were usually transferable and could be sold, but some were restricted to the original owner. If an excursion not covered by a licence was to be undertaken, a specific authorization needed to be obtained. As this took some time, it was impossible to legally undertake an excursion requested for the next day, without a licence. Clauzel first purchased licence 69 08 01 on 9 April 1958. 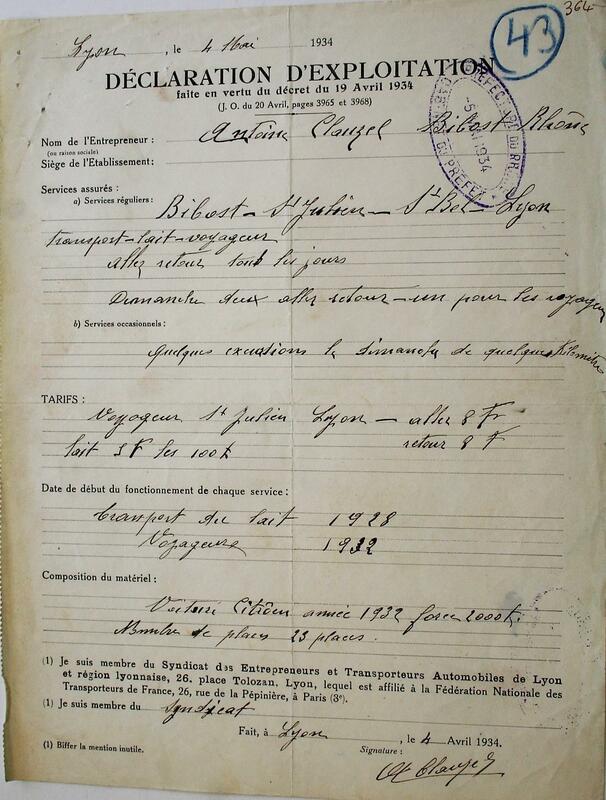 On 30 June 1963 licence 69 08 01 was sold for 6,000 F to Fontana, Brignais. Clauzel then had 12 vehicles but only 3 licences so had to request specific authorisations, which annoyed him greatly. He appeared to have overlooked that he could obtain additional licences without cost. 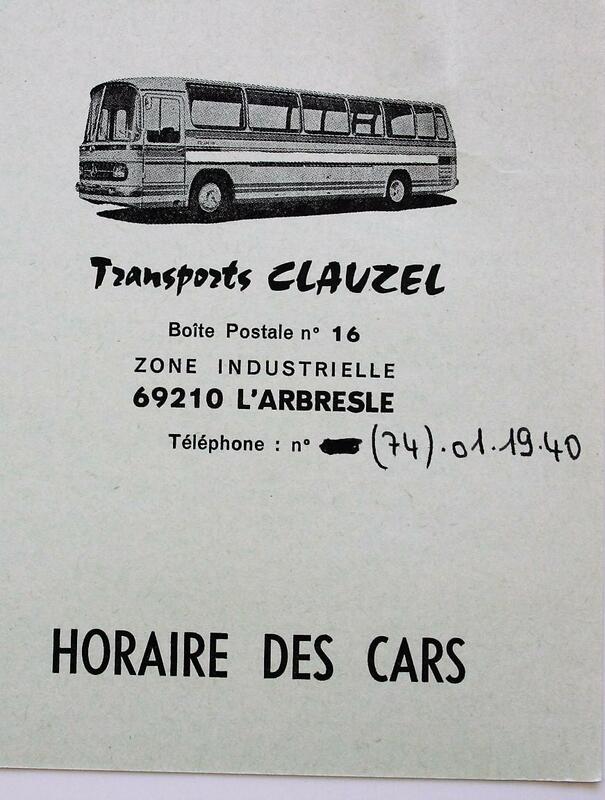 1972 A major change occurred with the setting up of the SA Transports Antoine Clauzel, with a capital of 100,000 Fr, at the L’Arbresle address. 75% of the capital was held in equal shares by Antoine (born on 10/04/10 at St Laurent de Chamousset) and his wife Francine née Mazallon. Nine family members held the remaining 25%. The reason for this became apparent on 6 October 1974, when Antoine retired, due to age and ill health, and Bernard Clauzel, presumed to be his son, became PDG. The next news dates from 1979. Bernard Clauzel was complaining to the authorities of the difficulty of obtaining fuel. In the light of what follows, it is assumed that suppliers were unwilling to continue when outstanding bills had not been paid. 1980 Bernard Clauzel approached RSAR with a view to selling them the business. On 15 November, RSAR produced their conclusions. The excursions included San Damiano in Italy – a contract for the transport of pilgrims once a year. RSAR believed the business was close to bankruptcy and had an on-going annual loss of 1.4 million Fr per year. 1981 On 26 February, the company went into liquidation. A little earlier, on 23/01/1981, SECAM (Maisonneuve) took over the operations in ‘location gérance”, for a period of 1 year renewable. SECAM carried the operating risk, and paid Clauzel 5,000 F per month (3,000 for the properties, 1,000 for the vehicles and 1,000 for the goodwill). A little later on 19 March, the founder, Antoine Clauzel, died. For the purposes of his estate, it was stated that there were 2 routes – Bibost to Lyon and Sain Bel to Lyon, and school routes from L’Arbresle to Le Morillon, Savigny, Bombeyron, Eveux and Ancy. 1983 Four vehicles were immobilized - 8027ER69, 7980DU69, 5200FP69 and 5201FP69, as being unroadworthy. 1984 For the San Damiano pilgrimage, the Ministry of Transport was still issuing the permit in the name of Clauzel, three years after the liquidation. Clauzel had just 3 vehicles still registered under its name. The beneficiary had to be quickly changed to SECAM. On 6 December, a ‘Concordat’ was signed between Clauzel and their creditors. The company no longer exists. And so the name of Clauzel disappeared from L’Arbresle.